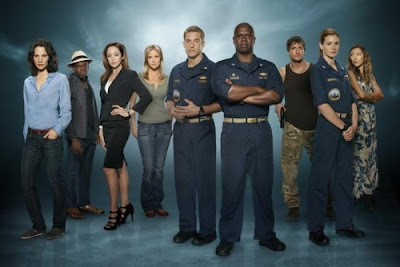 One Per Case: 'Last Resort' Series Premiere Review - "Captain"
'Last Resort' Series Premiere Review - "Captain"
Does the series premiere of ABC's sub drama Last Resort inspire us to keep watching? Click on the jump to find out. If there was an addition to the primetime lineup that has received more attention than ABC's Last Resort, I don't know what that is. On Thursday, anxious viewers got a chance to see what all the fuss is about, and I have to say it was well worth the wait. If you're reading this, then you know the plot, which involves an attack on the submarine USS Colorado and the crew's efforts to uncover who is responsible. This series is impressive, both in its scale and ability to bring the drama right back to its core characters. For each action sequence (nuclear missiles detonating in Pakistan) there is good dramatic tension among the crew as loyalties become divided, forcing the 150 crew members to quickly take sides. But it's the gravitas of Captain Marcus Chaplin (Andre Braugher, Homicide: Life on the Streets) who provides the greatest impact. He is sensational from the opening sequence, and his speech near show's end is a rousing challenge for the perpetrators who fired on his ship to take notice. There's also something to be said about the casting of Scott Speedman (Underworld) who fits in nicely as the XO Sam Kendal - his conflict will arise from questioning whether the actions of his captain really are, as he puts it, 'just crazy enough' to right this situation. The glue here is the work of Casino Royale Director Martin Campbell, who keeps the incredibly fast-paced story from succumbing to its own weight. Why this wasn't a two-hour premiere will befuddle me, as there was simply too much going on to effectively introduce every story. It's unclear as to whether Campbell will return for follow-up episodes, so let's hope Writer/Series Creator Shawn Ryan can slow things down just enough to educate without losing us. Will Patrick be the ballast this series so desperately needs? And this is where my big questions arise: How will the series unfold, given all the plots we've been presented? Certainly, a good second episode about the crew simply repairing the ship could have been sustained, as tensions grow as to who gave the order to fire on the Colorado. Another question revolves around who will serve as the show's third major actor? 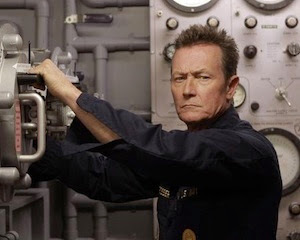 Is that role destined for Robert Patrick (Terminator 2), who was arrested for trying to incite a mutiny at the end of the episode, or perhaps another character who will bring Chaplin and Kendal to the middle? We'll need more time to determine that. But the real question is how long can a series last about a nuclear submarine whose captain uncovers a plot to do...something bad to our country? I can see that question being answered in a season 1 finale, but what happens after that? It's hard to imagine this plot line can survive much more than a season or two before audiences lose interest. Given the (almost too) fast pace of "Captain" it will be important to not shoot our wads before But, the potential for a big, serious, enthralling season 1 looks very appealing at this point, so I am definitely in. What did you think of the pilot episode "Captain?" Let us know by commenting below!